Oaklands was named after the area’s native Garry Oak trees. Originally a heavily forested area, it has been the traditional territory of the Lekwungen peoples (today’s Songhees and Esquimalt First Nations) for thousands of years. Soon after the Hudson’s Bay Company (HBC) established Fort Victoria, the area was surveyed in the 1850s and divided into large lots. Roderick Finlayson, chief trader of the HBC, purchased several properties including the land south of Ryan and west of Scott Streets. Sarah and Roderick Finlayson‘s 103-acre Rock Bay estate remained largely undeveloped until after Sarah’s death in 1906. The majority of development in Oaklands occurred between WWI and WWII. Before this, vast sections west of Bowker Creek and Hillside Mall were farmland. There were areas of swampland along Haultain Street. Although the area was surveyed as residential lots in the 1880s, the first significant building boom wasn’t until 1909-13. In 1908 an investment company proposed building houses on 350 lots covering 80 acres either side of Cedar Hill Rd, between Hillside and Bay. The development was to be known as Rockland Park. In 1911, suburban lots were advertised in the Daily Colonist newspaper for $500, promising “level lots, no rock”. Many lots were bought by investors and houses were built speculatively during the building boom. The development catered to moderate-income earners, and was promoted as “being only a mile from city hall, yet it possesses all the advantages with regard to pure air of rural surroundings”. The new residents were accommodated by an extension of the streetcar line along Hillside Avenue. The pre-WWI population increase resulted in the construction of Oaklands School in 1913. The boom ended in 1913-14, and the neighbourhood took many years to inﬁll with more homes. Hillside Mall, built 1962, and nearby Hillside Rd is Oakland’s main commercial centre. There is a charming cluster of small shops at Haultain Corners. In 1998 the original Oaklands Elementary School underwent a major renovation and continues in its role providing education to young children and serving as a resource to local community groups. 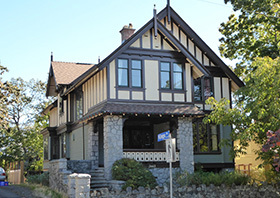 The Cridge Centre’s (originally the BC Protestant Orphanage) landmark 1893 building at Cook and Hillside, is home to BC’s oldest registered non-profit society and continues to serve the community. Oaklands remains largely a neighbourhood of single-family houses and is popular with families. In recent years, residents have advocated and worked for the protection of natural areas and the rural ambience of the streetscapes.